But, because text messaging requires visual, manual, and cognitive attention from the driver, it is by far the most alarming distraction. Each day in the United States, approximately 9 people are killed, and more than 1,000 people are injured in crashed that involve a distracted driver. Between 2012 and 2017, nearly 20,000 people were killed in accidents involving a distracted driver. 3,166 of those fatalities occurred in 2017. 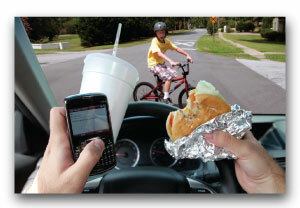 10% of drivers 15 to 19 years old involved in fatal crashes were reported as distracted at the time of the crashes. This age group has the largest proportion of drivers who were distracted at the time of the crashes. Drivers in their 20s are 38% percent of the distracted drivers who were using cell phones in fatal crashes. At any given moment approximately 660,000 drivers are using cell phones or electronic devices while driving, a number that has held steady since 2010. A 2015 survey reported that drivers do all sorts of dangerous things behind the wheel including brushing teeth and changing clothes. The survey also found that 1/3 of drivers admitted to texting while driving, and 3/4 saying they’ve seen others do it. Five seconds is the average time your eyes are off the road while texting. When traveling at 55mph, that's enough time to cover the length of a football field blindfolded. More than half of all adult cellphone owners have been on the giving or receiving end of a distracted walking encounter. CLICK HERE to download the optional Safety Talk form for your workplace.